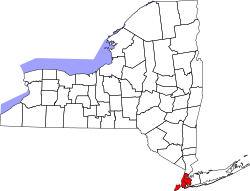 ^ Annual Estimates of the Resident Population: April 1, 2010 to July 1, 2015 – 2015 Population Estimates – New York. United States Census Bureau. [January 15, 2017]. ^ 2.0 2.1 FBI — Table 78. Federal Bureau of Investigation. ^ Fleet Report - Mayor's Office of Operations. www1.nyc.gov. ^ US DOJ Statistics 2000 互联网档案馆的存檔，存档日期2009-07-26. ^ 9.0 9.1 9.2 Lankevich, George L. American Metropolis: A History of New York City. NYU Press. 1998: 84–85. ISBN 0814751865. ^ Fosdick, Raymond. American Police Systems. The Century Co. 1920: 82. ^ Deal Raises Officers’ Pay 4% a Year. 《纽约时报》. 2008-08-22. ^ NYPD Officers Get 17 Percent Raises over Four Years 互联网档案馆的存檔，存档日期2008-12-01. ^ 2005 Duties, 1985 Pay. New York Daily News. June 29, 2005. ^ "Cop Exits Up 11%; Pay Prime Factor," 互联网档案馆的存檔，存档日期2009-07-01. by Reuven Blau, The Chief-Leader, March 7, 2008. ^ "Alarm Over Cop Exodu$," 互联网档案馆的存檔，存档日期2009-07-03. by Larry Celona and Bill Sanderson, The New York Post, Jan. 25, 2007, Page 4, Column 1. ^ Dolmetsch, Chris. Occupy Wall Street Judge Refuses to Throw Out Summonses. Bloomberg News. 14 December 2011. ^ Pinto, Nick. Protesters Sue to Stop NYPD from Acting as Prosecutors. The Village Voice. November 3, 2016. ^ 9/11 by the Numbers. New York Magazine. September 11, 2002.